Options: Model RED06JH1AS (Size 6) 1/10 Hp, 1450 RPM, 115V, 1 Phase, 60 Hz, 390 Max CFM @ 0" S.P. Model RED06JH1CS (Size 6) 1/10 Hp, 1450 RPM, 208-230V, 1 Phase, 60 Hz, 390 Max CFM @ 0" S.P. Model RED08JH1AS (Size 8) 1/10 Hp, 1550 RPM, 115V, 1 Phase, 60 Hz, 845 Max CFM @ 0" S.P. Model RED08JH1CS (Size 8) 1/10 Hp, 1550 RPM, 208-230V, 1 Phase, 60 Hz, 845 Max CFM @ 0" S.P. Model RED10MH1AS (Size 10) 1/4 Hp, 1600 RPM, 115V, 1 Phase, 60 Hz, 1,436 Max CFM @ 0" S.P. Model RED10MH1CS (Size 10) 1/4 Hp, 1600 RPM, 208-230V, 1 Phase, 60 Hz, 1,436 Max CFM @ 0" S.P. Model RED12MM1AS (Size 12) 1/4 Hp, 1150 RPM, 115V, 1 Phase, 60 Hz, 1,545 Max CFM @ 0" S.P. Model RED12MM1CS (Size 12) 1/4 Hp, 1150 RPM, 208-230V, 1 Phase, 60 Hz, 1,545 Max CFM @ 0" S.P. Model RED12QH1AS (Size 12) 1/2 Hp, 1750 RPM, 115V, 1 Phase, 60 Hz, 2,352 Max CFM @ 0" S.P. Model RED12QH1CS (Size 12) 1/2 Hp, 1750 RPM, 208-230V, 1 Phase, 60 Hz, 2,352 Max CFM @ 0" S.P. Model RED15QM1AS (Size 15) 1/2 Hp, 1150 RPM, 115V, 1 Phase, 60 Hz, 3,003 Max CFM @ 0" S.P. Model RED15QM1CS (Size 15) 1/2 Hp, 1140 RPM, 208-230V, 1 Phase, 60 Hz, 3,003 Max CFM @ 0" S.P. Model RED direct drive units are used to exhaust air from all types of commercial and institutional buildings such as hospitals and health care facilities, schools, recreational buildings, machinery and equipment rooms, offices, retail stores and similar applications. The nonoverloading wheel with its higher static pressure capability makes this unit suitable for eiher ducted or nonducted applications. It's roof mounting permits location near the area to be ventilated, allowing short duct runs and more efficient operation. 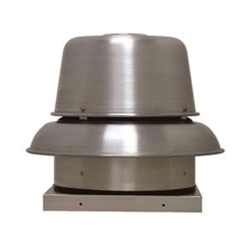 The spun aluminum exterior provides an attractive appearance and is compatible with belt driven Model DB and companion gravity units to make up a complete ventilation system. Direct drive units use similar diameter wheels, resulting in low sound levels and quiet operation. They have no belts or fan bearings to maintain or adjust and consequently require very little maintenance. • Heavy-gauge aluminum for extra strength with prepunched mounting hole. • Cover easily removed for quick access to motor compartment. • Water tight conduit tube for easy electrical connection from below roof. • Aluminum birdscreen and disconnect are included on standard models. • All aluminum backward inclined wheel. • Nonoverloading for safe operation in ducted systems. • Statically and dynamically balanced for smooth operation. • Sized for minimum 150% of drive horsepower. • Machined cast iron adjustable motor pulleys. • Adjustable base for belt tensioning. • Nonstatic oil resistant v-belts. • Single speed open drip-proof are standard. • 182T and larger motors shipped unmounted for field installation. • Disconnect switch standard with single speed drip-proof motors. 0" 1/8" 1/4" 3/8" 1/2" 5/8" 3/4" 7/8" 1" STOCK NO. STOCK NO.